(Bloomberg Opinion) -- You reap what you sow. As the auto world makes sense of Carlos Ghosn’s sudden fall from grace at Nissan Motor Co., one thing is clear: The legendary executive was a victim of dismal corporate governance at the company he sat atop for decades. Allegations against Ghosn include under-reporting his income in securities filings and making personal use of company assets. The deposed chief executive denies wrongdoing in connection with the allegations, Japanese broadcaster NHK reported on Sunday. Such ambiguity is only possible when decision-making bodies aren’t in place. Nissan lacks a board compensation committee, for example, which reviews executive pay and incentive plans. Such committees help create accountability and responsibility, corporate governance experts say. They can also help with oversight of succession planning, audit functions and new directors. Nissan had no board committees as of 2017. 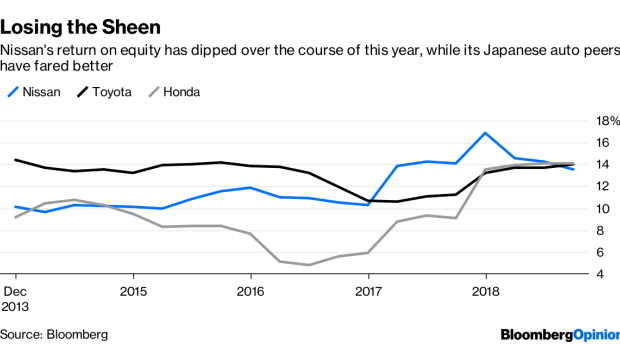 Ghosn may have turned Nissan around financially, ruthlessly slashed costs, and vaulted himself to star status, but the company remains steeped in outmoded traditions of corporate Japan. Nissan’s record shows as much. Compensation at Nissan typically consists of cash and share appreciation rights, according to the company’s financial reports. In theory, the amount to be paid is based on performance and executive pay of a peer group of other large companies, benchmarked by an outside compensation consultation. Pay packages are then approved by the chairman of the board, rather than the board itself. If executive pay wasn’t under the purview of the board, then what was? The company is vague about how the chairman’s pay is determined and whether there is a separate process for this. Ghosn has spoken often about scorecards and metrics for judging the performance of executives. How was his own performance judged? After a data falsification scandal last year, Nissan did little to improve governance. The company resisted outside directors for two years after Japan introduced a corporate governance code in 2015, according to Jefferies analyst Zuhair Khan, who has done extensive work on the topic. Nissan was one of 11 companies that balked, according to Khan. It finally added two new independent directors in April this year: One was a former racing-car driver and the other a retired bureaucrat with a background in energy. They joined a former Renault SA executive, whose independence is questionable given Nissan’s alliance with the French carmaker. Nissan approved the establishment of an advisory committee composed of independent directors only last week, after the Ghosn scandal broke. Such committees have become the norm in Japan Inc. under the corporate governance code but don’t have legal status. The company also said it would “study the creation” of a special committee to improve governance and handle director compensation. It smacks of too little, too late. In a sign of continued disregard for investors, Nissan’s auto-financing arm sold 60 billion yen ($532 million) of bonds last month, while it was already investigating Ghosn. Since the allegations came to light, Ghosn has hired lawyers and has told colleagues he acted appropriately when he didn’t report to regulators tens of millions of dollars of deferred compensation that was to be paid at his retirement, the Wall Street Journal reported Sunday. The fact that there is even wiggle room over whether such payments should be reported is hugely problematic and shows the need for more robust checks and balances. Whatever the outcome of this case, investors should steer clear of companies that don’t adopt the most basic of governance structures. If a star like Ghosn can be brought down, others may not be far behind.